Alloy rims with all-season tyres are just some of the complete wheels that the 123tyres.co.uk online store stocks for its customers. If you are looking for complete tyre packages that will meet all of your demands, you have most likely come to the right place. After all, you can opt for steel wheels or alloy rims according to your liking. If it turns out that you prefer cold weather tyres or winter tyres over all-season wheels, you can also find these tyres along with matching rims here. Buy complete wheels that include all of the centring rings, balanced screws and caps already. These fully mounted wheels are offered by many budget and premium brands from Continental, Dunlop, Bridgestone and Pirelli to Michelin, Goodyear, Toyo and Nankang to Nexen. 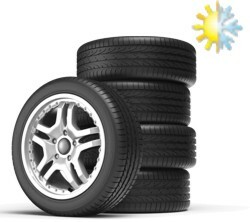 As such, you should be able to purchase the right set of tyres for your car here. Of course, these tyre and wheel packages are not merely offered for passenger cars. Instead, you can shop rims and wheels for SUVs, off-roaders, vans and even light trucks as well. The choice is yours. You will simply need to state your car model so that we can suggest the right kinds of alloy or steel wheels for you, which are offered at low prices.